In Asia, there is a land that consists of many cultures, wonders and excellent attractions that is waiting for you. That land is Malaysia. The heart and the capital of Malaysia is Kuala Lumpur, a modern global city that is constantly expanding outwards to the world. Kuala Lumpur is one of the most popular travel destinations for shopping, night life and city life atmostphere with the buzzling street lights along Bukit Bintang. More than any other destination in the country, Kuala Lumpur, or commonly known as "KL", is the most important point of new Malaysia. The city's past is still present in the British buildings during colonial times of the Dataran Merdeka and the midnight lamps at the Petaling Street night market. There are some interesting places to visit while in Malaysia. We will only touch a few at the moment. The Botanical Gardens and Bird Parks of the Lake Gardens consists of numerous varieties of Malaysia's plants and animals. On the other hand, at the busy Central Market, one can listen to the sound of music, people craft making, and enjoy and experience the cultural practices of people living in other states in Malaysia such as Kelantan and Sarawak. Malaysia's cultural history can be seen in its National Museum. To travel to Kuala Lumpur, we will basically tell you where it is generally located. 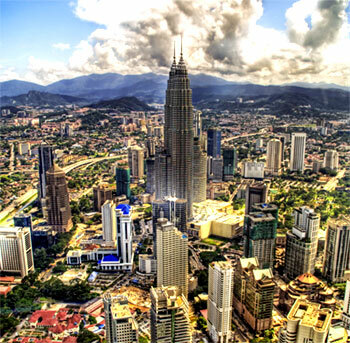 Kuala Lumpur is located midway along the West Coast of Peninsular Malaysia, between the Klang and Gombek rivers. It is about 40 km from the coast and is the most accessible place of the entire Peninsular Malaysia transportation network. Being the largest city in the country, Kuala Lumpur's population is about 1 and a half million people coming from all of Malaysia's many ethnic groups. The well developed public transport in KL will make your exploration of the city in a leisurely pace without straning your budget. Cheap air-conditioned buses and taxis are basically the most convenient modes of transport there. There is also the Light Rail Transit (LRT) System which provides a rather convenient means to travel around the city and its suburbs. With a height of almost 1500 feet above sea level, one of the World's Tallest Buildings rise above the skyline of Kuala Lumpur. They are The Petronas Towers (also known as The Twin Towers), and, without any doubt has become Malaysia's symbols for its remarkable growth that has taken place for the past 2 decades.